If one were to compile a list of the most iconic fictional characters of all-time, the Joker would rank right up there among Superman and Mickey Mouse. With his green hair, white skin, shocking style, and striking wardrobe, the Joker has been frightening and delighting audiences for years. Like many of his pop culture contemporaries, an extensive Joker collectible market has been built around his likeness and this guide will navigate you through his many comics, trading cards, and action figures using the tabs above. 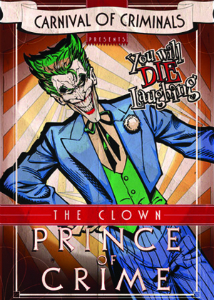 When the Joker was introduced to the comic book scene in 1940, the intention for the character was that of a one-off story where the Clown Prince of Crime would ultimately die at the end. Publishers thought wiser of this story line and let the Joker live and he was featured in many early issues of the Batman franchise. A criminal mastermind with an aptitude for chemistry, the Joker was originally a serial killer who took out his victims with a “joker venom” that left their faces smiling after death. This conceit has endured in the comics and was a critical component to the portrayal of the Joker in Tim Burton’s 1989 Batman film. The Joker's portrayal in comic books, films, and television has varied wildly from gimmicky court jester to sinister genius and all points in between, making him a character with several documented personalities for fans to select. While some adore the campy portrayal of a crazed madmen (a la Cesar Romero) others prefer the deranged instability of a truly tortured soul (a la Heath Ledger) and these contradictions have only helped the Joker to endure in popular culture for decades. Batman’s rogues gallery is one of the most iconic and impressive of any fiction story telling. Ask any random person on the street to name ten comic villains and the majority of their list will probably be from the pages of Batman comic books. King of them all, though, is the Joker, who has appeared in some of the most groundbreaking Batman titles of all-time. This list is only a starting point for collecting Joker comics as there are dozens, if not hundreds, of issues to comb through to compile a complete set. The Joker has appeared in virtually every Batman title released since 1940 and many of the ancillary titles such as Batgirl, Robin, and Nightwing. 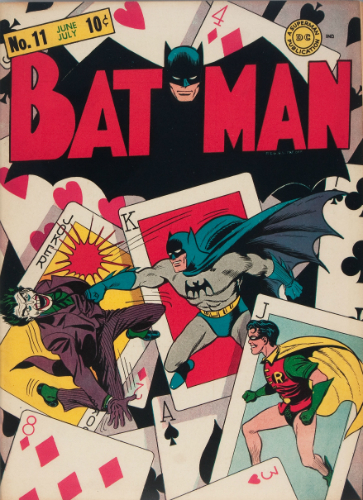 The Joker makes his debut in Batman #1 from the spring of 1940 and appears in nine of the first 12 issues of the quarterly comic. In March of 2016, a graded copy (NG) of this book with missing pages and no cover, sold online for $4,500. Obviously, tracking down a copy of this book is going to cost a great deal of money as will most of the other early issues of this comic book. 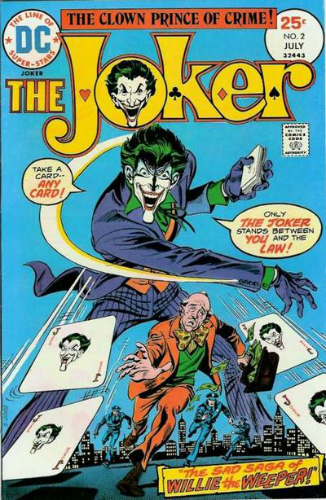 Later story arcs featuring the Joker will be easier on the pocket book such as "A Death in the Family," where Joker kills the second Robin, ran from issues #426 to #429. This has become one of the most important stories in Batman lore as well as comic books in general and can often be found online sold in complete bundles. Notable for being the first book to have a Batman villain as the titular character, The Joker ran for nine issues from 1975 to 1976. These issues are relatively easy to find at an affordable price point so new collectors could compile the entire series with ease. Collecting graphic novels may be more interesting to comic book readers than strict collectors but Joker is the subject of some very famous graphic novels that collectors would be wise to acquire. 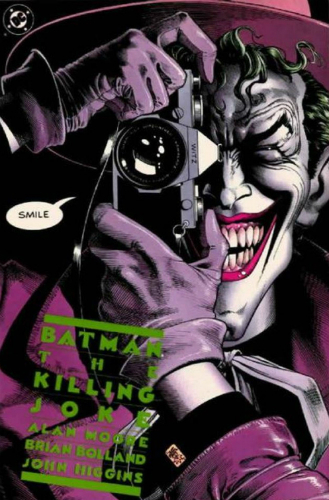 Batman: The Killing Joke, released in 1988, may be one of the most well known graphic novels in history and first editions can be found often through online auctions. 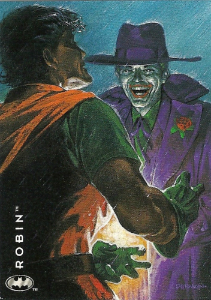 Other books, like Arkham Asylum (1989), and Joker (2008) are additional one-off stories centered around the Joker. There have also been several volumes of collected works that highlight the Joker’s greatest stories. Again, these are easy to track down and rarely appreciate in the same way comic books can but they should be considered when compiling a complete comic collection. Batman Gotham Adventures 60. (2003) LAST ISSUE!! LOW PRINT! JOKER!!! Batman and Robin Adventures 5. CLASIC JOKER!! EXCELLENT !!! Like the comic books, the Joker has been featured in just about every Batman-related trading card set ever produced, excepting those the cover movies he's not in. Although there is no single set devoted to the character, he can be found in many chase sets and insert cards. Being such a menacing subject inspires artists to come up with some truly scary and beautiful cards and a complete collection of Joker cards will not only be fun to acquire, but will look great and be fairly large. Topps has produced several cards with the Joker, dating back to their five 1966 sets. Three of those sets — Black Bat, Blue Bat, and Red Bat — are original art pieces while the other two sets are stills from the Batman film with Cesar Romero. These cards are incredibly valuable and will cost a fair amount of money to buy, especially graded. For much less expense, collectors may want to look into the Topps 1989 Batman cards based on the Tim Burton film. Many of these cards feature the Joker, as portrayed by Jack Nicholson, and are easy to track down at a low price. 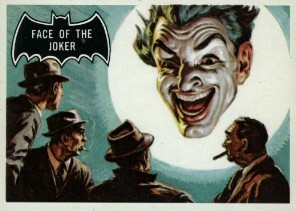 For many years, Skybox was releasing several DC card sets a year, most of which included at least one Joker card. In 1994, he appears in both the DC Master Series and Batman: Saga of the Dark Knight sets as well as the less popular DC Stars. In 1995, he can be found in Batman Master Series, DC vs Marvel, and Batman & Robin, the latter of which is based on the animated series and includes a chase set of pop up cards. 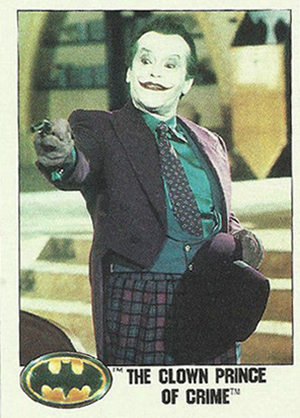 1996 has the Joker in the Firepower set of embossed trading cards. Because the Joker rarely appears in general DC trading card sets, collectors should focus their attention on the Batman-specific base and chase sets from the Skybox era. Current DC Comics trading card releases are handled by Cryptozoic. Quite a few Joker cards appear in base sets and chase sets and a great number of sketch cards have been released with his likeness. Because these cards are more recent releases, the likelihood of finding unopened hobby boxes, complete sets, or individual cards on online auctions is pretty high, but certain cards, particularly sketch cards which are all one-of-one, can command a high price immediately upon release. Cryptozoic’s Super-Villains (2015) includes a chase set of reprints from the 1966 Topps Batman series and the Batman Legend (2012) set includes a chase set of carnival posters — titled Carnival of Criminals — both of which feature the Joker. Between his slim cut suits, sadistic smile, and clown-like appearance, the Joker may be the character best suited for statues and action figures. In fact, he has a long history of action figures and his statues are very popular via online auctions. While compiling a full collection may be visually stunning and make your bookshelf look awesome, it’s going to cost a pretty penny, too. As with many comic book action figures, the Joker begins with Mego in the 1970s. While these may not be the most visually stunning figures by today’s standards, they are highly sought-after in collector circles and come in many variations, including packaging, costuming, face molds and colors. Mego released several Joker figures between 1974 and the end of the decade before Kenner released the action figure every child of the 80s/90s owned with 1984’s Super Powers Joker. Kenner produced that figure for many years but 12 backs from Series 1 can be very valuable. 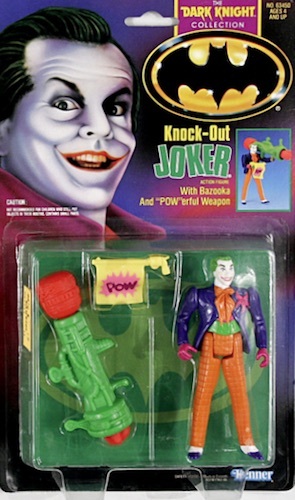 Kenner also released Joker figures in 1989 that were modeled after the Jack Nicholson likeness. Mattel has released many Joker action figures in their current lines, including a Heath Ledger inspired figure and a recreation of the famous Joker/Harley Quinn comic book cover. Tracking these down in gradable condition is pretty easy but they’re a great place to begin an action figure collection. Joker has been the subject of some very vibrant and downright frightening statues over the years and many of those have become quite valuable. 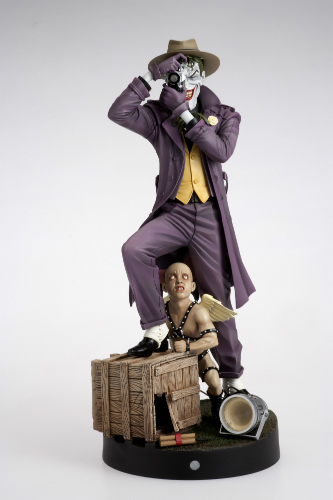 Sideshow has been prolific in their releases of Joker statues with designs based on the comics, the Arkham video games, and the Dark Knight film. These limited edition statues are of exceptional quality and are often sold above retail value almost immediately after release. Kotobukiya is another option, coming in at a slightly lower but still premium price point, with exciting statues in full-action mode, including a Frank Miller-inspired fight between Batman and Joker and a stunning recreation of the Killing Joke comic book cover. There are other smaller designers releasing brilliant work in addition to the DC Direct line of statues, so every price point is fairly represented on the market. With his inclusion in every Batman film franchise, a legacy of comic stories to rival any superhero, and his pivotal role in one of the best received Batman video games of all time, Joker has managed to find himself in several Funko forms. 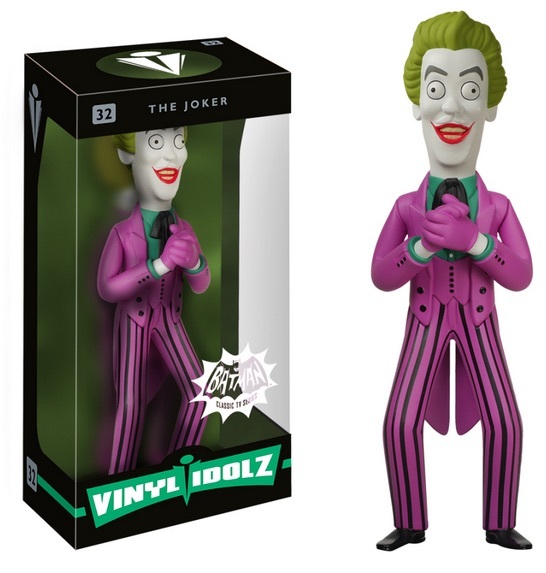 Joker is represented in Funko’s standard Pop line as well as their Wacky Wobblers series fashioned after the 1966 television show, the Dark Knight film, and several comic designs. When considering Funko figures into a collection, it is important to seek out retail or comic-con exclusives and discontinued figures as their value is more likely to climb at an accelerated pace. NEW! Kotobukiya ArtFX+ DC Comics Batman 52 The Joker 1:10 Scale Statue.